SYRACUSE, NEW YORK (Nov. 5, 2015) - The Global Social Enterprise Institute, an Initiative of international consultancy Short Enterprises with offices at Le Moyne College's Madden School of Business, announced on Tuesday the launch of the world's first financing platform for high impact social entrepreneurs at Syracuse University's #1-ranked S.I. Newhouse School of Public Communications. The platform, known as SourceFunding.org, will streamline the small business loan application process and match high impact social entrepreneurs of all backgrounds with the qualified community banks and loan programs that are most likely to provide financing. "After 2 years of planning, development, and putting the necessary collaborative partnerships in place, we are very pleased to be transitioning into the regional pilot phase for the SourceFunding.org platform," said Institute President W. Michael Short. "This represents an important and exciting milestone in scaling SourceFunding.org into a national and then international platform that will empower community entrepreneurs and the community banks that support them." Entrepreneurs and organizations throughout New York State who are also members of the Institute will have exclusive access to the SourceFunding.org™ process and a dedicated Institute representative to assist with the loan application process. What differentiates SourceFunding.org™ from existing online financing platforms, viewed by many to be "predatory lenders," is that it utilizes an innovative process tapping into the national network of 14,000 community banks in the U.S., which typically offer lower and more competitive interest rates that save applicants money. Additional benefits of SourceFunding.org™ include pursuing multiple financing opportunities simultaneously and saving considerable time, while also protecting the credit scores of entrepreneur applicants. Another differentiating factor is that the launch has involved a key constituency that the platform is working to support, with roughly 500 undergraduate and graduate students engaged from over a dozen institutions of higher education. "By working with the Global Social Enterprise Institute and Newhouse alumnus W. Michael Short, we are able to offer truly unique in-class opportunities for engaged and applied scholarship for students so they're motivated to do amazing work that actually has impact within the real world," said Professor Joe Cunningham, instructor of an Advanced Public Relations Writing for the Digital World course, which is collaborating with the Institute on the launch of SourceFunding.org™. "Being able to review the real-world results of their in-class work in real time provides an incredible opportunity for my students to learn from the hard work that they are putting in, that is actually helping the world." Syracuse University graduate students at the Martin J. Whitman School of Management collaborating with alumnus on the Global Social Enterprise Institute and the launch of SourceFunding.org. 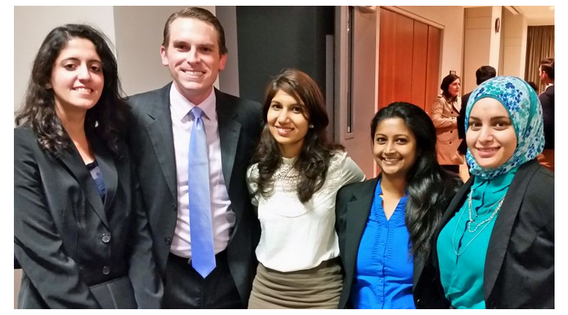 Pictured from left to right: Courtney Chapman, Roamell Mehta, W. Michael Short, Blendrit Elezaj, and Supriya Shivananda. Joseph Erskine, hospitality entrepreneur and volunteer with GSEI, also highlighted the Institute's focus on supporting and empowering veterans. "As a retired officer of the U.S. Navy, it's incredibly rewarding to help facilitate collaboration between the GSEI, our partners, students, and veteran owned businesses," said Erskine. "We are particularly excited about our collaboration with Greensky Management Group, a service-disabled veteran-owned small business that is now serving as the official marketing firm for our Institute." Short expressed his deep appreciation and gratitude to the many organizations and individuals that have contributed to the growth of the Institute and its programming. "The progress we have made to date is a reflection of our incredible team and global network of supporters," said Short. "None of this would've been possible without the early support of people like Jim Joseph, Joe Sisko, Bill McAvoy, Diana Skurka, Janessa Price, Tracy Couto, Aishik Barua, Chandana Chandrashekar, Kim Bischoff, and all of the members of our Leadership Council." The Institute and its funding platform are powered by international consultancy Short Enterprises and evolved out of a Clinton Global Initiative-sponsored Commitment to Action, featured in "What's Working: Small Business" by the Huffington Post in partnership with Goldman Sachs 10,000 Small Businesses, working to support the growth in the social enterprise and impact investing sectors throughout the world. For more information, contact the Global Social Enterprise Institute by clicking here. Headquartered in the Madden School of Business at Le Moyne College, the Institute provides an international platform for the exchange of ideas and resources for social and high impact entrepreneurs with the belief that the combined powers of capitalism and philanthropy can solve our planet's most pressing environmental, community, and economic challenges. The Institute arose from a Clinton Global Initiative-sponsored Commitment to Action spearheaded by international consultancy Short Enterprises and leverages a consortium of 250+ university and institutional collaborators. Through programming, research, community engagement initiatives, and an international network of partners and student-run university chapters, the Institute is empowering global change-makers & accelerating their impact. S.I. Newhouse School of Public Communications partners with alumnus on project with Clinton Global Initiative to support entrepreneurship across the U.S. The largest network of funding sources and resources for entrepreneurs, startups, businesses, & community organizations. Join the businesses & organizations in 70+ countries that receive our exclusive content. GSEI & SourceFunding.org are initiatives of SHORT ENTERPRISES. Copyright © 2011-2017 by SHORT ENTERPRISES. All Rights Reserved.